'A good book - if it has the right message in it - it can change a whole human being into something he never thought he would be'. 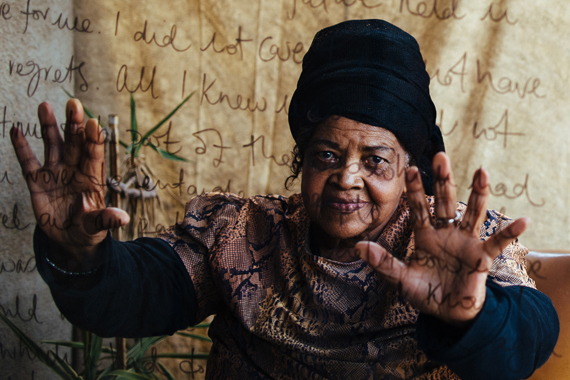 Those are the words of Miriam Tlali in an interview she did in 2014, as part of Adrian Stern's 21 icons of South Africa project - a visual celebration of 21st century South African icons. My mother used to carry a copy of the manuscript around, wrapped in a cloth. There were quite a number [of publishers] whom I tried and they all turned it down. 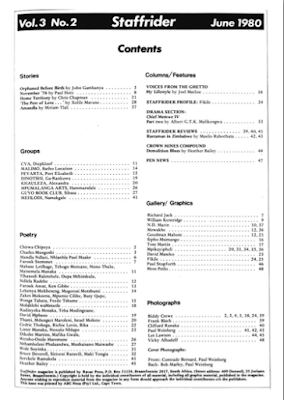 Finally, the system gradually changed, and in 1974 somebody told me about Raven Press. However, they changed the title to 'Muriel at Metropolitan' and took out words and whole passages. They said it would be banned otherwise and they would not be making any money off it. I refused for a year to give my permission to publish. 'Not under that title,' I said. But my mother started complaining : 'I am getting old and I shall die without seeing your book. Let them publish it.' And so it was published [and almost immediately banned]. 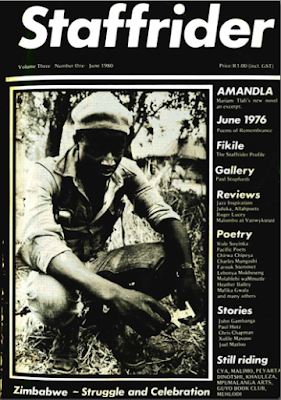 Clip from Southern African Review of Books. 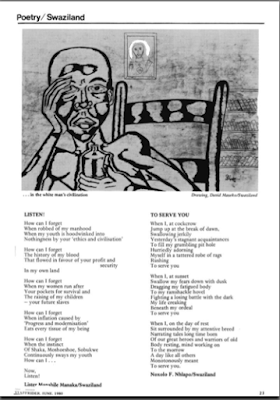 Muriel at Metropolitan, a semi-autobiographical work that drew from Tlali's experience as a bookkeeper in a furniture shop, was banned in 1979 by the Apartheid government. 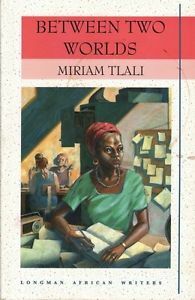 However, it was published internationally as Between Two Worlds by Longman African Classics in 1979. 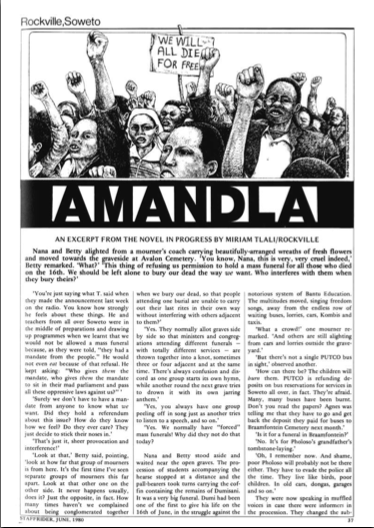 Tlali's next book, Amandla, published in 1980, was also banned weeks after it was published. 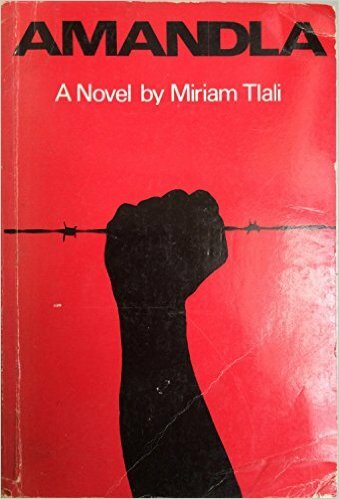 It was based on the 1976 Soweto uprising when young people in the township 'rose up against the decision to make Afrikaans compulsory as a medium of instruction in black schools'. Similar to Muriel, it gained international recognition and was translated into several languages, including Japanese, Polish, German and Dutch. 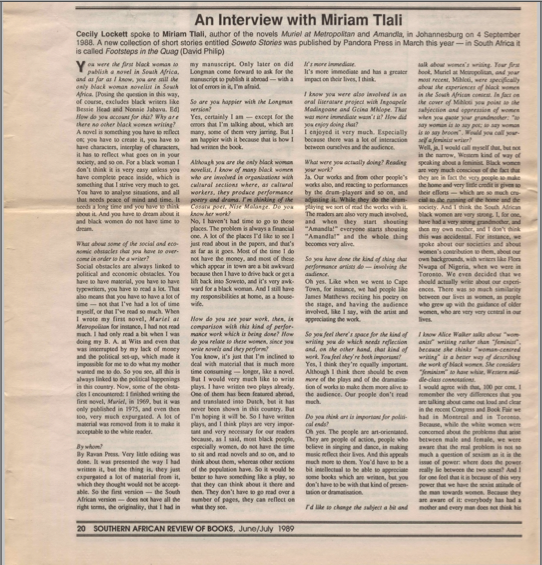 In 1984, she wrote a collection of short stories, interviews and non-fiction, Mihloti. Both Muriel and Amandla were unbanned in 1986. In 1989, Footprints in the Quag (named Soweto Stories by Pandora Press) was published. You know, while I was still working there, I grew to become very unhappy and restless ... Every Sunday, we would take our children to the freedom square to listen to our leaders speaking. People like Oliver Tambo, like Nelson Mandela. So I was very restless because I found that I was doing the kind of work which is done by people who are busy stalking Africans ... [so] I decided to leave my work. 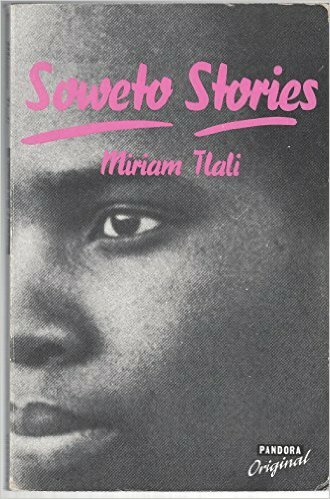 Miriam Tlali also co-founded Staffrider - one of South Africa's most important literary magazines in the 1970s and 1980s - and wrote a regular column 'Soweto Speaking'. 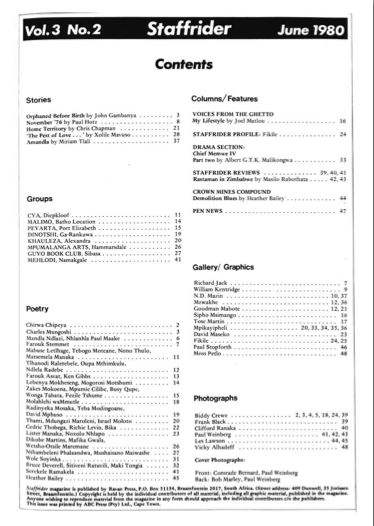 Here's a look at Volume 3, Issue 2 of Staffrider published in June 1980, which included an excerpt from Amandla. Images from the volume are all via South African History Online. In 2001, she was officially recognised as the first African woman to publish a novel in South Africa by the Department of Arts, Culture, Science and Technology. In 2005, they again honoured Tlali as a recipient of their Literary Lifetime Achievment Award. Three years later, she was awarded the Presidential Award for her immense contribution to South African Literature ... As a member of the Women's National Coalition, Tlali slo assisted in the drafting of the Preamble to the South African Women's Charter. 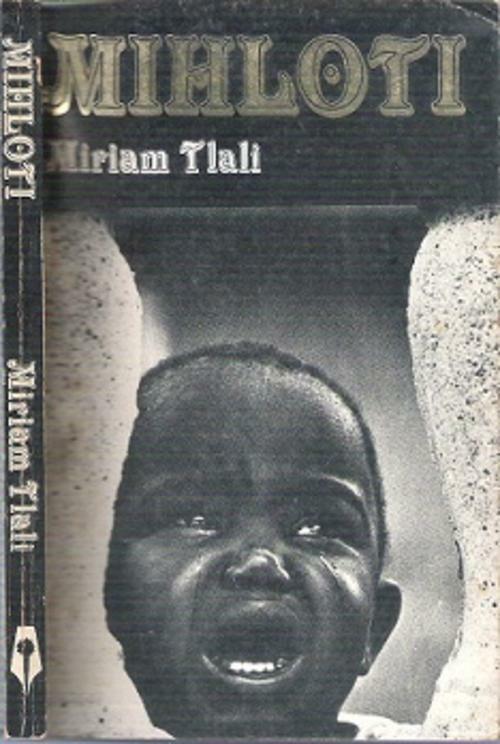 An absolutely phenomenal woman, check out more photos of Miriam Tlali from 21 icons on this Pinterest page, and watch the stunning short film where Tlali shares her lifestory. 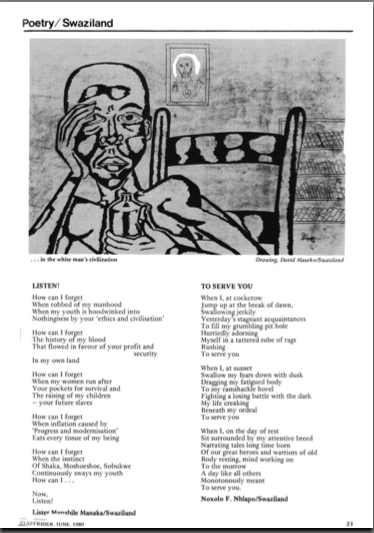 UPDATE: It is with sadness that I write that Miriam Tlali passed away on February 24, 2016, as announced by the Department of Arts and Culture in South Africa on twitter. So this post is in her memory. The Department also paid tribute to the late author, which can be found here.